Note: This is a re-post of the article written for the VMware vCloud Blogs. This article assumes the reader has knowledge of vCloud Director, Site Recovery Manger, and vSphere. It will not go in to depth on some topics, we would like to refer to the Site Recovery Manager, vCloud Director and vSphere documentation for more in-depth details around some of the concepts. This solution is very much about Disaster Recovery OF the Cloud infrastructure itself using Site Recovery Manager and vCloud Director. This is not intended to be a fully integrated solution, but rather a way to use both products together to achieve BCDR of the cloud. Creating DR solutions for vCloud Director poses multiple challenges. These challenges all have a common theme. That is the automatic creation of objects by VMware vCloud Director such as resource pools, virtual machines, folders, and portgroups. vCloud Director and vCenter Server both heavily rely on management object reference identifiers (MoRef ID’s) for these objects. Any unplanned changes to these identifiers could, and often will, result in loss of functionality. vSphere Site Recovery Manager currently does not support protection of virtual machines managed by vCloud Director. 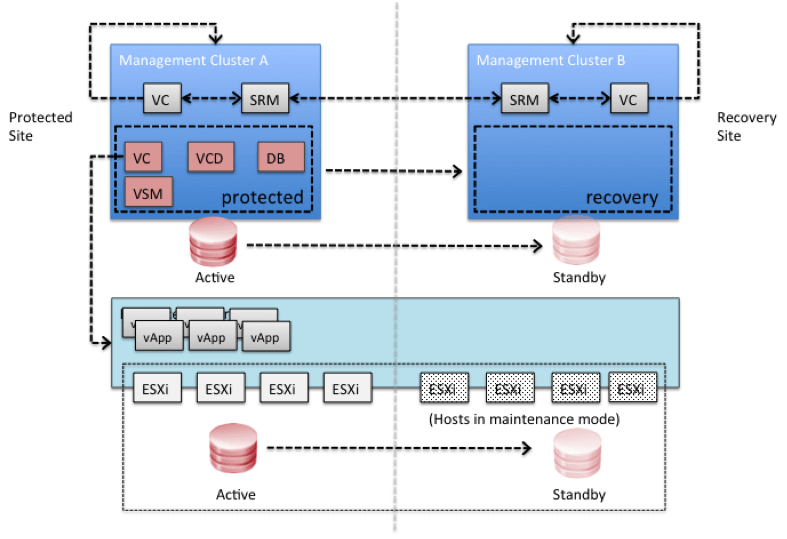 vCloud Director disaster recovery can be achieved through various scenarios and configurations. This blog post is focused on a single scenario to allow for a simple explanation of the concept. A white paper explaining some of the basic concepts is also currently being developed and will be released soon. The concept can easily be adapted for other scenarios, however you should inquire first to ensure supportability. This scenario uses a so-called “Active / Standby” approach where hosts in the recovery site are not in use for regular workloads. As all vCloud Director management components are virtualized, the virtual machines are moved over to the Recovery Site while maintaining all current managed object reference identifiers (MoRef IDs). Re-signaturing the datastore (giving it a new unique ID) has also been avoided to ensure the relationship between the virtual machines / vApps within vCloud Director and the datastore remained intact. Note: Although we have not specifically validated it, yes this solution/concept would also apply to VMware View. Chadwick, the whitepaper will go into a bit more detail in a couple weeks, so yes this is more of the overview. I agree there is more to it and there is a split between DR vs “availability”. We were asked to come up with a pure site based DR solution to failover “the cloud” from one site to another. This makes that happen. There will be more to come I am sure now that we have some basis. How would you handle the failover of the Nexus 1Kv switch VSM VMs? It seems that we have to use standard vSwitch port groups for this procedure to work. Since the VSM’s are virtual machines they could simply be added into the SRM failover same as the other supporting virtual machines like vCO. That is the simplicity of the solution is that anything that is part of the “Management” layer can be failed over like the other appliances.